Purchasing vs. 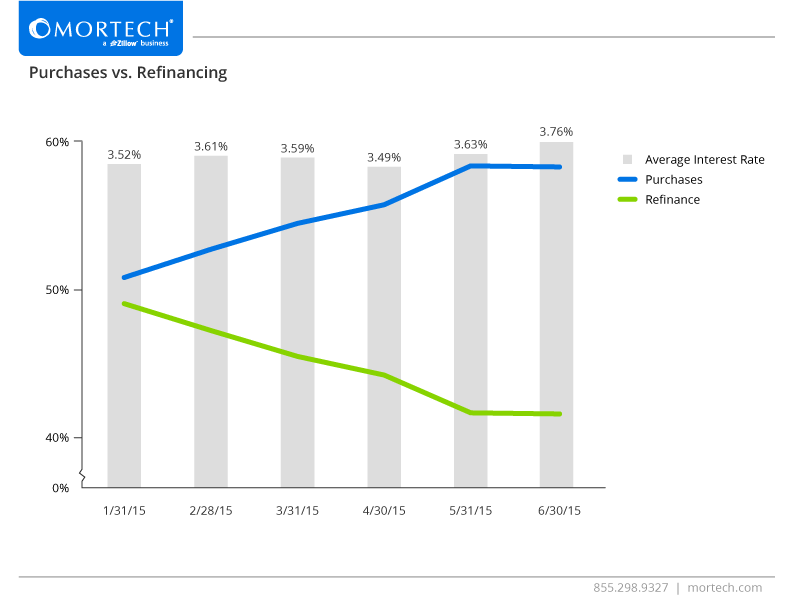 Refinancing: Where Are We Now? Back towards the beginning of the year, we pulled some data internally from Marksman to take a look at Purchases and Refinances, and monitored their relationship with the interest rate throughout 2014. Now, as it’s halfway through 2015, we’ve decided to revisit the data and take a look at how the landscape has changed since we last looked into it. If you remember from our previous blog on this data, towards the end of 2014 purchases and refinances were trending towards equilibrium, and this was largely due to the fact that interest rates were on a downward slope throughout the year. As we closed out December and headed towards 2015, it seemed as though purchases and refinances would cross over and continue moving in their respective directions, provided the interest rate continued to trend downward. However, through the first half of 2015, the data has pulled a complete 180 from where it was just six months ago. Interest rates, for the most part, have been on the rise, and with them refinances have gone down substantially, while purchases have begun increasing once more. As we enter the second half of 2015, it will be interesting to see not just how the interest rate changes, but how everything else falls in line with that change. Whether refinances are on the rise or more people are purchasing, you need to ensure you’re putting out the best possible rates online as fast as possible, all while reaching the widest possible consumer base. At Mortech, we’re constantly working to provide you the best software to advertise your rates and connect with more customers, as well as provide you with all the features you need to get the job done. Click the button to find out more about what you’re missing without Marksman, today.